Hey there! Today is my stop on a fun blog tour showcasing the Lily fabric line by Sue Penn for Penny Rose Fabrics. It's such a pretty line with different shades of mint, pink and yellow with subtle hints of grey and red. It's light and fresh. Such a fun palette to be working with as winter is ending and spring begins. I decided to make a scrappy looking Double Irish Chain with Lily. This was just a quick shot I took after I had made and cut strip sets. The more I worked with this fabric the more I loved it! I still have to quilt it. I plan on making another twin size just like it and giving them to my 2 youngest girls. I just love the colors and pattern together. It's such a sweet mixture of polka dots, plaids, and florals. Lily is available this month. I'll be sure to share my finished quilts with you! 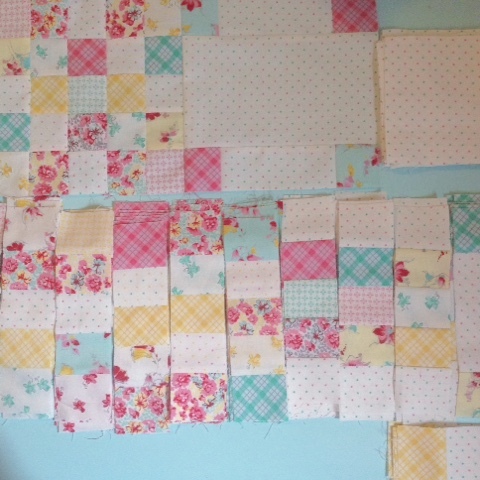 I'm hoping to do some pretty quilting in that negative space on the alternate blocks. Thanks for stopping by! This is gorgeous, Erin!! Love the bright fabric prints with the background fabric - perfect pattern to showcase this spring-like quilt! It is just beautiful!!! I'm inspired to make it baby boy colors! That is just too beautiful for words! Truly! Love love this quilt. What a great scrap buster too. I love your mini nines pillow. Smaller projects are great for trying out new patterns or designs. 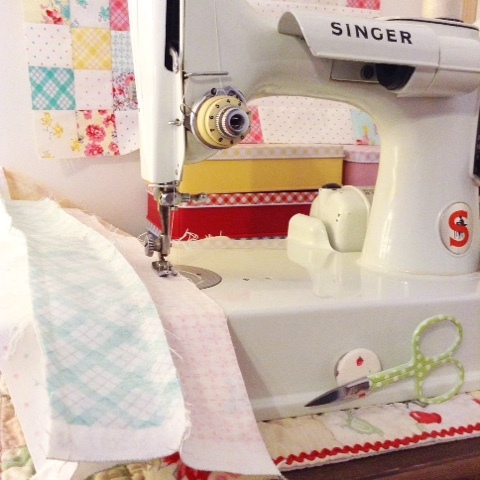 I use scraps for quilts, pillows, tote bags, gifts, etc! I store my scraps at my mom's house because she has more room. We use bins and shoe boxes for pre-cuts and yardage. Love your style of quilting. Great colors. Love the bright fabric prints with the background fabric - perfect pattern to showcase this spring. Love the blocks as well as the fabrics you use for them, I am planning to make some next month since I am still loaded with projects. As for fabrics or if you want to order fabrics you can click here.